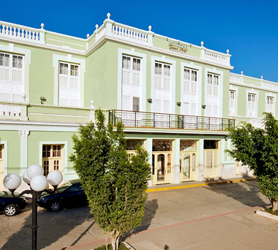 Hotel Villa Guajiamico technically not in Trinidad, however being just 42 kilometers (26 miles) from Trinidad on the main road from Cienfuegos we’ve added it to the list as it’s an ideal hotel for those who have a rent a car and wish to visit both cities from one central location. Furthermore, Hotel Villa Guajimico has its own international diving center with courses for amateurs and certified divers alike. Other nautical sports such as Kayaking, Catamaran sailing, and others, allow guests to enjoy its Caribbean Sea location to the fullest. 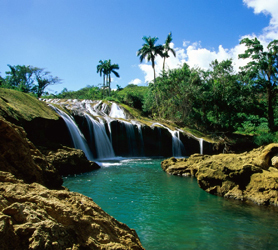 Guajimico is located on the coastal foothills of the striking Guamuhaya massif, one of the most comprehensive ecosystems in Cuba. Trekking from the hotel on one of its many organized ecotours is a must, a highlight of which is the cave known as Cueva de la Virgen (Virgin Cavern), stories and legends of pirates and corsairs intrigue guests to these unusual caves. Being midway between two of the Caribbean’s most beautiful and historically important colonial cities, Cienfuegos and Trinidad you’ll easily be able to visit both from Villa Guajimico. Our booking process is unique because it shows the best rate from all of these for Villa Guajimico hotel in Trinidad and the types of rooms available. Our Villa Guajimico Trinidad rate comparison is an industry first for Cuban Hotels. Once you’ve compared the rates, finalizing the booking at Villa Guajimico Hotel takes just seconds and an immediate confirmation is provided in real-time. Los Helechos also known as Complejo Topes De Collantes is a hotel located at 800m above sea level close to Trinidad in Cuba. The Hotel at Topes De Collantes is all about relaxation and offers saunas and large Olympic size indoor swimming pool allied to the outdoor pool next to the hotel. Continuing the theme of relaxation, the Complejo Topes De Collantes Hotel Trinidad offers an amazing massage service and spa service for guests. The hotel is a convenient base for visiting Topes de Collantes national park and the many wondrous ecotourism offers available. Those with a car can visit Trinidad easily and the hotel is a perfect mountain retreat for those looking to relax after days of wandering around the eclectic sights in Trinidad’s city center. Our booking process is unique because it shows the best rate from all of these for Hotel Topes De Collantes hotel in Trinidad and the types of rooms available. 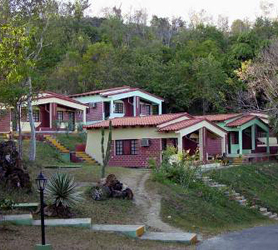 Our Hotel Topes De Collantes Trinidad rate comparison is an industry first for Cuban Hotels. Once you’ve compared the rates, finalizing the booking at Hotel Topes De Collantes Hotel takes just seconds and an immediate confirmation is provided in real-time. Hotel Las Cuevas meaning Hotel of the Caves is located next to a set of caves which, according to legend, reach the Trinidad city center. The Hotel Las Cuevas Trinidad itself is just a few short minutes of the old town, Colonial Buildings and astounding architecture millions of people visit Trinidad to experience. Set on natural hillside overlooking Trinidad the Hotel Las Cuevas is distinguished by its family clientele and close proximity to the city. Kids are at home in its beautiful gardens which surround the enormous on-site pool at the resort. 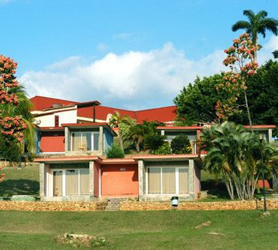 The Hotel Las Cuevas Trinidad is 3 star properties with 114 rooms, 104 of which are standards and 10 juniors-suites. All of them with air conditioning, telephone, satellite TV and safe included, with the amazing views of the city thrown in for free. Our booking process is unique because it shows the best rate from all of these for Las Cuevas hotel in Trinidad and the types of rooms available. Our Las Cuevas Trinidad rate comparison is an industry first for Cuban Hotels. Once you’ve compared the rates, finalizing the booking at Las Cuevas Hotel takes just seconds and an immediate confirmation is provided in real-time. 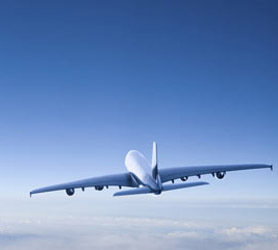 Are you looking for cheap flights to Cuba? 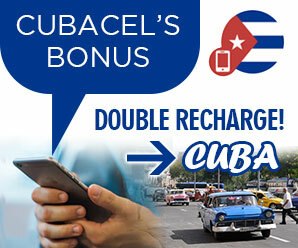 Immediate confirmation of your flight to Trinidad Cuba is just 2 clicks away. We also offer a price comparison of all available airlines to Cuba and Trinidad to allow you to get the best flight deals to Cuba right now. Our Cuba flight checker is free and can help you plan your vacation budget. 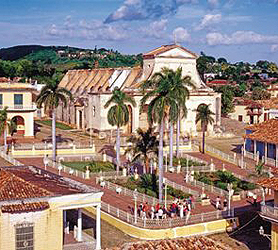 Once you have booked your flight to Trinidad Cuba, you can conveniently book your hotel, car rental or any other service on this one website, we are also available on our chat system should you need any personal help with your travel to Cuba or to coordinate your whole trip to Trinidad. We also offer VIP arrival services, airport transfers and much more, just ask us on our chat system and well coordinate your whole trip for you! 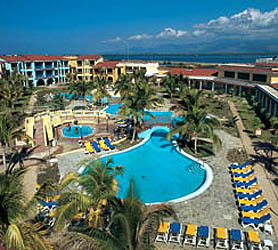 Hotel Brisas Trinidad Del Mar is an all-inclusive resort located on Trinidad’s famous Ancon Beach. 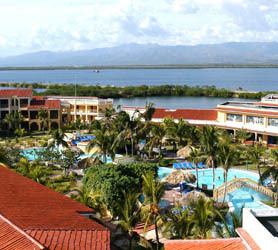 The resort resembles the colonial architectural style of the city. Just minutes from the historic city center it’s an ideal location that allows you to visit the Historical Town center of Trinidad, a Unesco World Heritage Site or to visit the surrounding hills of Topes de Collantes with picturesque waterfalls. After a long day sightseeing, you can back to the beach to relax on the white beach boarding the Caribbean Sea. This Hotel makes it easy for those with family’s offering a great kid’s club, children’s swimming pool, and special all-day entertainment for children. But there’s plenty of appeal for everyone thanks to a wide range of recreational attractions such as tennis, beach volleyball, and water sports that include jet-skis, catamarans, kayaks, and windsurfing. The Hotel Brisas Trinidad Del Mar has a total of 241 rooms with spacious sundecks and palm-shaded lawns for ground level rooms. Guests get a choice of three restaurants on-site restaurants offering a nice mix of dishes. The evening cabaret shows are excellent, and for more lively nightlife you can visit Trinidad city center which is a 20-minute taxi ride away. Perfectly situated on the pristine Ancon beach near Trinidad Center, guests get the best of both worlds with the enigmatic UNESCO declared colonial city on one side and the amazing Ancon Caribbean sea beach on the other. See the HOTEL ANCONS stunning views of the mountain massif of the Escambray Sierra providing a combination of sea and mountains for all its guests. Staying at the hotel Ancon you’ll be able to visit the historic town and colonial area of Trinidad, while staying at a relaxed All Inclusive Hotel right on the beach. There is a frequent shuttle bus service between the hotel and the town of Trinidad, which is only a 12 minute drive. 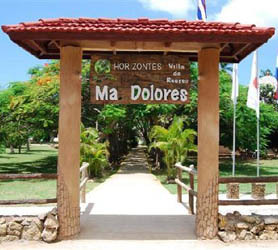 Hotel Maria Dolores Trinidad is situated just 3 Km. away from the city of Trinidad. Located in a natural rustic environment it offers pure relaxation when you are away from the city center and the historical patrimony of Trinidad’s abundant colonial architecture. Close by youll be able to discover the rural areas and the aboriginal settlement influence of the city. For those of you who wish to spend time at the hotel, It offers lively daytime and evening entertainment and traditional ecotourism activities throughout the day. 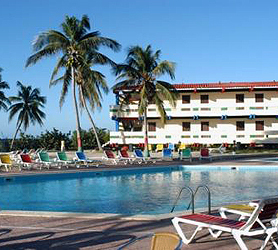 Hotel Maria Dolores Trinidad has a total of 44 rooms with air conditioning, telephone and international satellite TV.